The Iowa Flood Information System (IFIS) is an evolving web tool that is continually expanding the scope of its features. IFIS now offers Iowans access to flood inundation maps for 24 Iowa communities, up from 10 communities in 2013. Flood inundation maps are particularly useful during flood events to help people visualize the potential extent of flooding at a range of river levels. 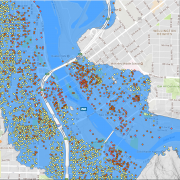 This information can help individuals and communities plan and make sound mitigation decisions, and allows homeowners, business owners, and others to see how predicted flood levels might affect their property. Please Note: These are NOT regulatory floodplain maps that can affect insurance. Rather, they offer information people need to plan for and be ready for future flood events. From the IFIS homepage, select the button for “inundation maps.” Users can then select one of the highlighted communities listed above and use the flood map controller slider bar on the right to see the potential extent of flooding at any selected stage or discharge. IFIS uses a Google Maps interface, so users can zoom in and out, switch to different views (satellite and street view), and navigate around the map. Also new on IFIS is the web tool Hazus, which allows users to estimate the cost of flood damages to buildings and other structures in various flooding scenarios. Hazus data is currently available for 12 Iowa communities, and IFC researchers are working to expand the tool to cover the entire state. Currently, IFIS provides flood loss and damage estimation for Cedar Rapids, Des Moines, Iowa City, Independence, Kalona, Rock Rapids, and Rock Valley. Hazus, developed and distributed by the Federal Emergency Management Agency (FEMA), is a multi- natural hazard analysis tool. The web tool models the effects that natural hazards of various intensities can have on buildings and other structures in a given area, and then quantifies the total damage in dollars. Users can view flood damage for one of these communities by clicking on the “Damage Estimate” button and sliding the “Flood Map Controller” to model different scenarios. For example, users can select Iowa City, simulate a 30-foot stage flood, and receive a total damage estimate of $19 million, which factors in the number of buildings damaged and the cost of the damage to their structure and content. Users can also click on individual buildings in the flooded area to access estimates of content and structural damage to those buildings. IFC researchers plan to add additional analysis layers that will include the number of schools, critical structures, and emergency centers affected in the damage estimate. 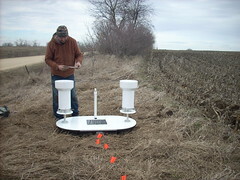 The research team will add the additional layers after bringing the current level of analysis to all Iowa communities. In May 2017, the Iowa Flood Information System (IFIS) added data to the web from HAZUS, which allows users to estimate the cost of flood damages to buildings and other structures in various flooding scenarios. HAZUS data is currently available for seven Iowa communities, and Iowa Flood Center (IFC) researchers are working to expand the tool to cover the entire state. HAZUS, developed and distributed by the Federal Emergency Management Agency (FEMA), is a multi- natural hazard analysis tool. FEMA first released HAZUS in 1997, and its most recent version, HAZUS 4.0, is capable of analyzing floods, hurricanes, tsunamis, and earthquakes. The web tool models the effects that natural hazards of various intensities can have on buildings and other structures in a given area, and then quantifies the total damage in dollars. In 2017, IIHR Research Engineer and Assistant Professor Ibrahim Demir and graduate research assistant Enes Yildirim integrated HAZUS datasets into IFIS. Yildirim extracted the flood related datasets from HAZUS, including census data on demographics, buildings, structural content, and the number of schools and critical structures near rivers, and integrated it into existing IFIS flood maps. Yildirim also analyzed how emergency responders could use HAZUS and created a user-friendly web-design that would be intuitive and easy for decision-makers and the public to use. How does HAZUS work on IFIS? Currently, IFIS provides flood loss and damage estimation for 12 communities: Cedar Rapids, Cedar Falls, Des Moines, Fort Dodge, Iowa City, Independence, Kalona, Monticello, Ottumwa, Rock Rapids, Rock Valley, and Waterloo. To calculate flood damage for one of these communities, users can hover their cursor over the “Flood Maps” tab and find their community under the “Flood Map Scenarios for Communities” button. Then, after clicking on the “Damage Estimate” button, users can toggle the “Flood Map Controller” to model different scenarios. For example, users can select Iowa City, simulate a 30-foot stage flood, and receive a total damage estimate of $19 million, which factors in the number of buildings damaged and the cost of the damage to their structure and content. Users can also click on individual buildings in the flooded area to access estimates of content and structural damage to those buildings. Demir says that level of detail will be useful for decision-makers and ordinary citizens who need to evaluate scenarios specific to them. Demir and Yildirim plan to add additional analysis layers that will include the number of schools, critical structures, and emergency centers affected in the damage estimate. Demir and his team will add the additional layers after bringing the current level of analysis to all Iowa communities. The Iowa Flood Center (IFC) offers a suite of online tools, the Iowa Flood Information System (IFIS), that allows all Iowans to access the latest community-based flood information. IFIS is a user-friendly online application based on a Google Maps interface. To launch IFIS, visit http://ifis.iowafloodcenter.org. New for 2017, IFIS offers a more responsive design. New features include a community flood map widget that allows website owners to add a customizable IFIS widget to their site. IFIS users can also download the IFIS app to their smartphone or tablet for fast, convenient, real-time data (view download instructions here). In addition, IFIS users can sign up to receive a text with current flood conditions from a specific stream-stage sensor close to their home or business. IFIS also provides flood inundation maps for 22 flood-prone communities across Iowa. These maps allow users to see what a forecasted flood crest would mean for their home or business. Maps are available for Ames, Cedar Rapids, Charles City, Columbus Junction, Des Moines, Elkader, Hills, Humboldt, Independence, Iowa City, Kalona, Maquoketa, Mason City, Monticello, Ottumwa, Red Oak, Rock Rapids, Rock Valley, Spencer, and Waterloo/Cedar Falls, Waverly. 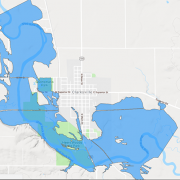 IFC researchers continue to develop flood inundation maps for more Iowa communities every year, including at least four new maps this year for Clarksville, Ida Grove, and Fort Dodge. IFIS helps Iowans make better-informed decisions on flood planning and mitigation efforts and alerts communities in advance to help them prepare for and minimize potential flood damage. Watershed management authority groups across the state can also use IFIS to assist with conservation planning to improve soil and reduce flood risk and to protect people and infrastructure. The Iowa Legislature established the Iowa Flood Center at the University of Iowa in 2009 to provide accurate, science-based information to help Iowans better understand their flood risks. It is the nation’s first academic center devoted solely to the study of floods. For more information, visit www.iowafloodcenter.org. If you have questions related to current flood conditions, please contact the Iowa Flood Center at 319-384-1729. The Iowa Flood Center (IFC) at the University of Iowa has an online tool, the Iowa Flood Information System (IFIS), allowing all Iowans to access the latest community-based flood conditions, including current stream and river levels at nearly 300 US Geological Survey and IFC gauges across the state. To access IFIS, go to http://ifis.iowafloodcenter.org. From this page, users can launch IFIS. Flood inundation maps for select communities, including Ames, Cedar Rapids, Charles City, Des Moines, Iowa City, Mason City, Ottumwa, Spencer, and Waterloo/Cedar Falls. One tool in IFIS allows users to view possible inundation in some communities. Another tool allows users to view daily rainfall alongside current river conditions.